There's a new cartoon in the works and THQ is going to publish the accompanying videogames. Yup, Voltron is back. If there's one thing that those horrible Transformers movies have proved, it's that giant robots are a hot commodity these days. Accordingly, it's not super surprising to hear that another 1980s robot icon is getting brought back into pop culture. That's right, folks: Voltron is coming back, and THQ is going to publish its tie-in games. While THQ has acquired the game-publishing rights to the franchise, little other information is available at the moment. However, it was revealed that World Events Productions (the animation/distribution company that created Voltron out of material from Japanese cartoons Beast King GoLion and Armored Fleet Dairugger XV) would be working with THQ on the games. The press release also mentions that the franchise will receive a new TV series later this year. "The video games relationship with THQ, along with our master toy relationship with Mattel, signals the exciting future ahead for Voltron," said Robert Koplar, Vice President of World Events Productions. "With its signature robot lion action and titanic-scale battles, our Voltron games and toys along with our new series are sure to have enormous appeal to fans of all ages around the world." 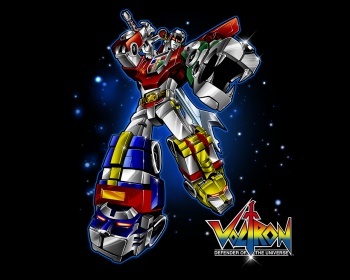 I'm not going to lie: My inner child is absurdly excited to hear that there's going to be a new Voltron game in the future. At the same time, my inner cynic (read: Inner realist) is shouting that this will most likely be a half-hearted tie-in game with shoddy production values, no real story, and mediocre (at best) game mechanics. Here's hoping the inner child doen't get crushed by reality.